Counties of New Brunswick shown in dashed lines with ALLCAPS names. 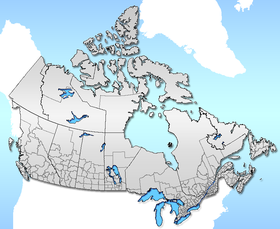 This is a list of the counties in the Canadian province of New Brunswick, with population and county seats (known in the province as shire towns). Before New Brunswick was partitioned from Nova Scotia, it consisted of Cumberland and Sunbury Counties. Counties were at the top of a three-layer local government system. Below each county were parishes (townships), Some, but not all, parishes were then further subdivided into municipalities. The exception to this was the municipality of Saint John which was not in a parish but was a sub-division of Saint John County. With the New Brunswick Equal Opportunity program in 1966, county councils were abolished. Counties continue to be used as an organizational unit, along with parishes, for registry of real-estate and to some extent taxation thereof. They figure prominently in residents' sense of place and continue as significant threads in the Province's cultural fabric (i.e., most citizens always know which county they are in). They still appear on most maps. Albert County 29,158 28,846 1.1 Hopewell Cape 1807.88 16.1 Formed in 1845 from part of Westmorland County and a small part of Saint John County. Carleton County 26,220 27,019 -3 Woodstock 3312.72 7.9 Formed in 1831 from part of York County. Charlotte County 25,428 26,549 -4.2 St. Andrews 3426.97 7.4 One of the original 8 counties. Gloucester County 78,444 79,943 -1.9 Bathurst 4743.67 16.5 Formed in 1826 from part of Northumberland County. Kent County 30,475 30,833 -1.2 Richibucto 4552.92 6.7 Formed in 1826 from part of Northumberland County. Kings County 68,941 69,665 -1 Hampton 3484.22 19.8 One of the original 8 counties. Madawaska County 32,741 33,422 -2 Edmundston 3461.89 9.5 Formed in 1873 from part of Victoria County. Northumberland County 44,952 46,204 -2.7 Newcastle, now part of Miramichi 12868.78 3.5 One of the original 8 counties. Queens County 10,472 11,086 -5.5 Gagetown 3686.05 2.8 One of the original 8 counties. Restigouche County 30,955 32,594 -5 Dalhousie 8580 3.6 Formed in 1837 from part of Gloucester County. Saint John County 74,020 76,550 -3.3 Saint John 1463.7 50.6 One of the original 8 counties. Sunbury County 27,644 27,143 1.8 Burton 2696.53 10.3 One of the original 8 counties. Victoria County 18,617 19,921 -6.5 Andover, now part of Perth-Andover 5505.56 3.4 Formed in 1844 from part of Carleton County. Westmorland County 149,623 144,158 3.8 Dorchester 3666.15 40.8 One of the original 8 counties. York County 99,411 97,238 2.2 Fredericton 8131.77 12.2 One of the original 8 counties. ^ Pincombe, Alexander (1984). The Birth of a Province. p. 2. ISBN 0888387873. ^ "Statistics Canada, Population and Dwelling Count Highlight Tables, 2016 Census". www12.statcan.gc.ca. Retrieved 2017-02-10. ^ "Provincial Archives of New Brunswick". archives.gnb.ca. Retrieved 2017-02-10.